Beer with a lot of letters in the name, music with a big band, big numbers and a big night on the porch. Deep red in color, this ale starts off with a floral, slightly citrus hop nose, hop flavor soon fades into the malty backbone of this red ale. in the classic style that is India Pale Ale (IPA) and they are in Newport, Oregon USA. This is a 650ml bottle (22 fl oz), and the beer is 80 IBU, and 6.2% ABV, and 186 calories a serve size. The bottle contains 3.18 standard drink units. However Rogue call this “India Red Ale”, but it might also be “American Amber” or “Red Ale”. Now the last time I had an “India Red Ale” it was defined as “Amber Ale” – that would be the 8 Wired Tall Poppy but all you get from that is the style is not well defined and even possibly includes ‘American Strong Ale“. So, I’m going to go with – Red IPA “American red ale brewed at a higher strength and hopped like an IPA. Typically, redder in color than an IPA, with deep ruby hues” Sorted. 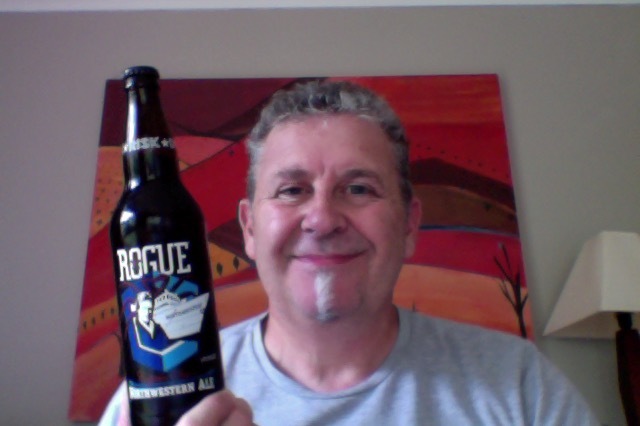 Rogue’s Northwestern Ale, brewed for Captain Sig Hansen joins the Rogue family of World Class Ales, Stouts, Porters, and Lagers. Dedicated to the Hansen Brothers–Sig, Edgar, and Norman–the Rogues of the Bering Sea. What an adventure so far, and so I press on, what could got wrong? A more muted aroma on opening than I would have expected from an IPA type beer, I might venture that this isn’t the freshest version of the beer that you can get, transport distance and all that. Having said that it does pour magnificently and looks very ‘red’ in the glass, dark deep burn chestnut, and brownish foamy head as well, it’s turned itself around. Nice grass happens at the front that is stern but also mellow, washes over the tongue and finishes slightly bitter, with a bit of linger in there too. I’m not sure that there is a lot of balance in this. The bitterness is ‘strong’ and persistent in this and it leaves you feeling a little unbalanced, and thinking you are drinking an overly unnecessarily bitter beer. I don’t get the warming malts in this at all. So it’s not bad, it’s just not great. The pdubyah-o-meter rates this as 7 a of its things from the thing. I think that this is interesting but not accurate or on point with any particular thing it is trying to make. The style is confused and I ended up not liking the overly bitter lingering mouthfeel in this. OR not a style that I’m comfortable with, it’s too bitter at one and with no middle and a finish that is too long. Am I enjoying it? I am odds with a yes and no on this. I like the beer, I’n not sure I’m enjoying the mouthfeel and lingering bitterness though. Would I have another? I’m not sure that i’m that much of a fan. Would I share with a friend on a porch and set the world to rights? Sure to start a debate over what it is and where it fits, it’s not an IPA, and I’ve had other ‘Red’ ales that are different. Musically, Well stop me in the street but I was listening to Bjork, and the Biophilia Live thing. The album, composed during the 2008–11 Icelandic financial crisis, is considered a concept album, with references to the linking points between nature, musicand technology. It’s a bunch of jangles and performance art with lyrics not understood. The Audience is enthusiastic though, so I go with the crowd, or against it. 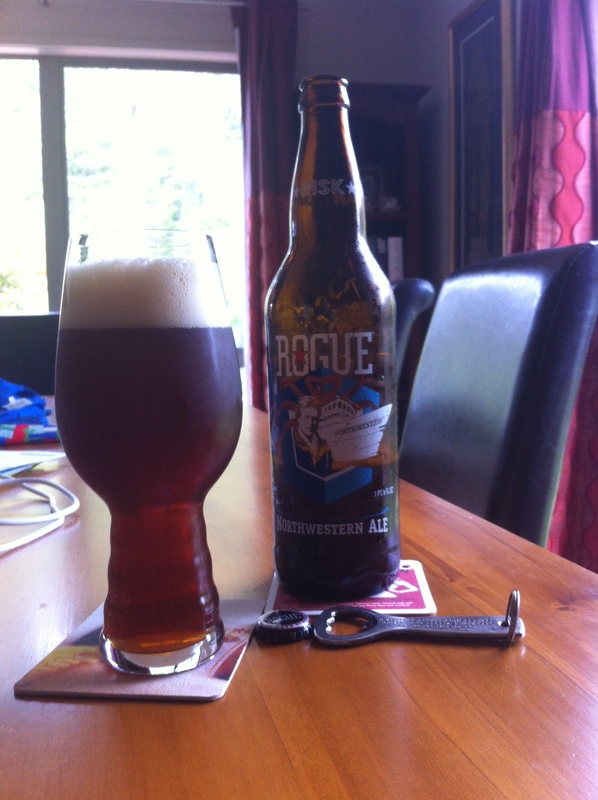 This entry was posted on January 8, 2015 by Philip Walter in Amber Ale, Beer, Beer of the USA, Beer Review, Craft Beer, Critic, Imperial/Double IPA, Red Ale, Rogue and tagged Alcohol by volume, Beer, Captain Sigs Deadliest Ale (Northwestern Ale), craft beer, India Pale Ale, India Red Ale, Northwestern Ale, Pale Ale, Rogue Ales, Rogue Captain Sigs Deadliest Ale (Northwestern Ale).